Welcome, download, enjoy and share! A simple ´fill-in´ exercise, where students should decide whether to use FOR or SINCE. 35 sentences included. No answers, but the exercise is easy. Enjoy! Ooops, I ve just noticed two mistakes in my WS, namely - sentence 28 I HAVE HAS - should be I HAVE HAD !!! sentence 32 Midway - should be Monday :) SORRY FOR THAT!!! 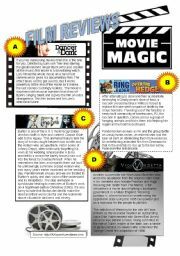 Reading activity based on four film reviews (real!) with exercises on VOCABULARY and UNDERSTANDING OF THE TEXT. Reviews are a bit difficult but the questions are easier. Answers included. Enjoy! 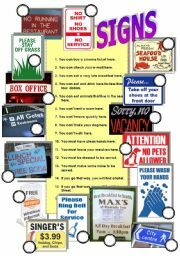 An activity - sheet designed to revise MUST / MUSTN´T / CAN / CAN´T and general vocabulary that you can see in the streets and roads of any English city. 19 sentences and 19 pictures to match. Enjoy! Nice reading for intermediate / advanced students. 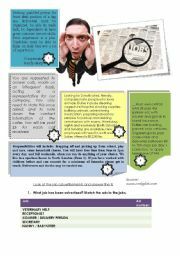 Students read the job advertisements (real!) and perform matching, reading for detail and vocabulary exercises. 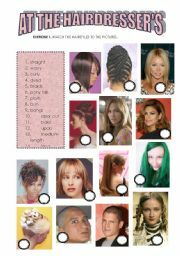 Three activities for revising / introducing the vocabulary used when we are at the hairdresser´s. Includes 1)hairstyles matching picture and word, 2)verbs (matching picture and word) 3) causative sentence formation - the prompt cards can also be used as role play cards for conversation. Enjoy! 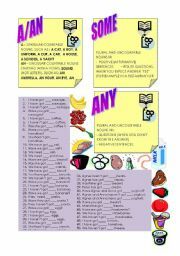 A useful activity - sheet containing 50 sentences with blanks and some grammar rules concerning the use of a / an / some / any. Designed to practice and drill the differences between some / any / an / a. "Fill the gaps" exercise - this time pre-intermediate sentences with JUST, ALREADY, YET. 35 sentences included. 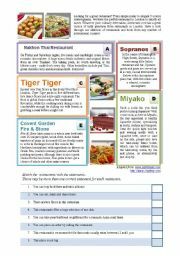 Reading activity based on real English website with REAL London restaurants. Students read the descriptions and match them with correct statements. Answers included. 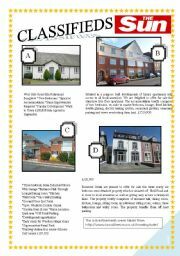 Reading for detail.Students read for classifieds (small ads) concerning selling houses/apartments and match the ad to the questions. PERFECT EXERCISE FOR REVISING HOUSE VOCABULARY.The ads are REAL and were taken from THE SUN, so students can experience real life English. ANSWERS INCLUDED. Enjoy. 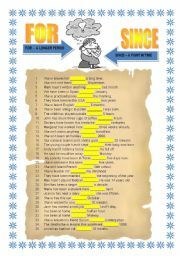 An activity - sheet designed to revise MUST /CAN / CAN´T and general vocabulary that you can see in the streets and roads of any English city. 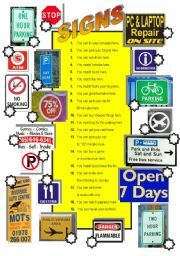 16 sentences and 16 pictures to match. This is a second part. Enjoy!